Situated on the Mill Pond of Centerport, this cozy colonial built almost 100 years ago has a great history with more to come. The spectacular water views mirror the kitchen’s creations and humble service. 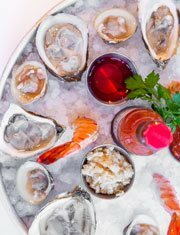 Come sample the finest sushi, chilled raw bar, aged steaks and the freshest local seafood that Long Island has to offer. Our extensive wine list recieved the Wine Spectator “Award of Excellence” for 2018. The heated outdoor patio is open year round so don’t think of us as a summer only place. Open 7 days a week for lunch and dinner from noon ’till close. Brunch is served Saturdays and Sundays from noon till 4pm. Catering all of your family or business events is our specialty. Please call our managers to discuss your party options. If you are too busy to dine with us, call in a take-out (all of our menus are online). If you are looking for a unique gift idea, gift cards are available by phone, online or in person in any denomination. We look forward to taking care of you the next time you are in the area. or call us at (631) 261-7663.